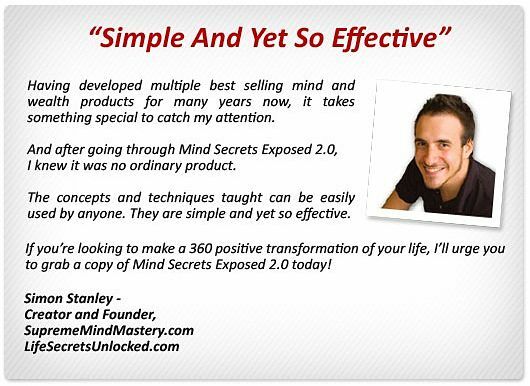 Mind Secrets Exposed 2.0 Review – Detailed and Honest! Mind Secrets Exposed 2.0 is an online personal development course which teaches individuals how use the power of their Mind to attract more wealth, happiness and well-being in their lives. Before I even start with the review, I’d like to let you know that I am, and I always will be, 100% COMPLETELY HONEST and truthful with all of my recommendations and suggestions. If I have purchased a product myself and have used it, I’d tell you. If I haven’t, I’d explicitly let you know that all the information I’ve gathered comes from testimonials and other people’s experiences with that particular course. Mind Secrets Exposed 2.0 is a program I DID indeed purchase, and I’ve already been through it several times. So everything contained in this review comes from me personally and it is hundred percent honest with the pure intention to HELP you. Perhaps it is not the best one out there, but it certainly is worth having it in your personal development library! What is Mind Secrets Exposed 2.0 all about? How does it work and what can you expect from it? Should you invest in this program? You can skip to any individual section if you want, but I HIGHLY recommend that you read everything through – especially if you tend to purchase this course! The last thing I want to do is trick you in taking action for something that you’ll later regret – that’s why I suggest you to read carefully everything! 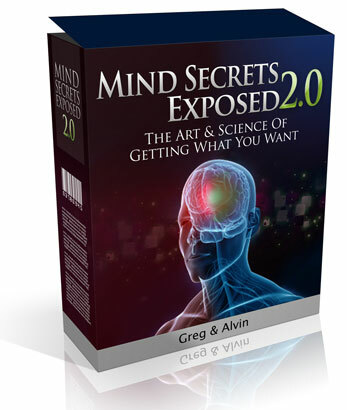 Mind Secrets Exposed 2.0 was released in the late 2013 and is the best course from Greg Frost and Alvin Huang. It is an All-In-One self-improvement home-study course intended for anyone seeking greater wealth, greater health, greater happiness and passionate love in their lives. It is basically about unleashing our subconscious mind powers by tapping into it with some special methodologies, tips and techniques which the authors have gathered from different sources including through their own experience. 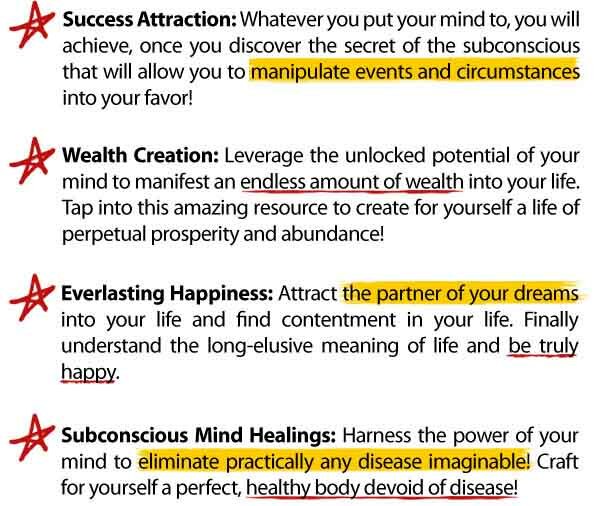 It is also about the law of attraction but it doesn’t present it in the way it was in the movie “The Secret”. The essence of most of the teachings is using the power of affirmations, visualizations, praying and the like, in order to shift our paradigm and conditioned mind for us to live a more abundant and more fulfilled life. You get a comprehensive self-improvement home-study program (157 pages fancy e-Book consisted of 18 chapters) which touches upon all important life areas including wealth, health, happiness and relationships by teaching you how to unlock and unleash your subconscious mind powers. You’ll also get a copy of the Dream Planner for FREE, which is actually a quite handy and powerful tool – It is a simple 11 page handbook with 4 Major Steps which you can immediately undertake to manifest wealth and abundance in your life and I think that this will be useful to everyone. 60 Days Risk Free – Probably should be the first on the list! – If for some reason you’re not satisfied with the product, you can ask for a refund at any time during the first two months which is quite awesome if you decide that this program is NOT for you. I personally never asked for a refund. After you purchase Mind Secrets Exposed 2.0, you also get a free access to the “Success Monthly Subscription” which in turn will further provide you with some excellent tips and tricks for manifesting successfully your desires and goals. This program is literally intended for all kinds of people regardless of their background. So no matter who you are and what you do – this program is for YOU. It doesn’t matter if you’re 55 years old or just entering college, it doesn’t matter if you’re running your own business or work as a secretary – either way, the principals taught are universal and will work for you equally as well. I love the “Try This” tables at the end of each chapter. 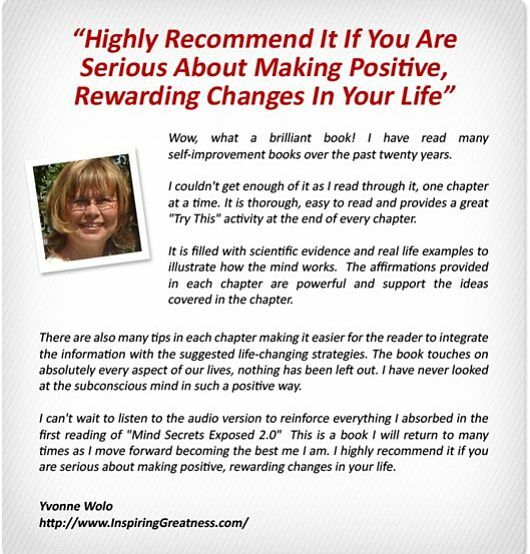 These are special sections of the eBook with some practical steps you can immediately undertake to improve some aspect of your life. They include detailed guides on visualization, affirmations, prayer and the like. One valuable lesson I took from this program is the awareness how “over-determination” and “forcing” change upon my subconscious mind can actually have the exact opposite effect and lead to destruction. I now understand the difference between “brute-force” (of affirmations or determined visualization) and “true faith” (which is always done in a relaxed and positive manner). The program also taught me a lot about having deep reservoirs of gratitude within me at all times. Another great lesson I got from this journey was about the timing and receptiveness of my subconscious mind. Although I knew a lot about the Alpha State of mind and of the receptiveness of our mind during the period of “just before falling asleep”, I still wasn’t acting upon it, because I was not TRULY aware of it. I now constantly reprogram my subconscious mind at “the lowest level”. For some of you, this information might be sufficient enough to simply purchase the program straight away; however, I strongly recommend that you take a look into the “downsides” of it as well! For me personally, the narrator and his voice are quite irritating. That’s a one downside to the audiobook (for me) – I couldn’t quite follow him at all times as it is not very clear when a new “Title” begins. However, you can always follow and read the eBook in synchronization with the audio book – and that’s exactly what I did. Another downside is that the creators of the program are not actually famous personal development coaches or celebrities like Anthony Robbins for example. Their background is unclear and you probably won’t have heard about them before. Of course this doesn’t necessarily mean that this is bad. I believe that they’ve gathered this information from some great sources (mostly from the books from Joseph Murphy, besides their own experience) and that there are some very useful tips and advice within the program. However, the authors are not top-notch personal development gurus. At times, you might get the feeling of information overload and repetition of the same ideas. (Although the e-book is almost 160 pages long, most of the time it talks about the same ideas and you might get the feeling that you’re going in a circle). Although the program is intended for everyone (including religious and non-religious people), they do in fact talk a lot about God so if you’re an atheist this might bother you at some point. The entire program will cost you $67 (discounted from $197) which for some people might be a lot. However, this is an investment in yourself and not a “cost”. Also, don’t forget that many awesome bonuses are included in that price. If you’re currently on a tight budget, then I would honestly advise you to rather go and purchase “Think and Grow Rich” from Napoleon Hill and “The Power of the Subconscious” by Joseph Murphy (if you haven’t already…). These two books are very powerful and you will learn a lot from them. You can afford to skip this program for now if money is an issue. Some of the information and techniques laid out in the program might seem too vague and difficult for you to implement. You might get the feeling that you don’t feel comfortable with them, and you might have difficult time adapting to these methods. As with everything else in life – you have to invest time and effort and you won’t change overnight. Results will come only if you apply the techniques and no amount of reading will do you any good. You should understand that Mind Secrets Exposed is a “digital product” – meaning, no physical copy is provided upon purchase. Some people are reluctant to hearing audio or reading an e-Book, however, you can print it out at any time so you can solve that issue easily. Assuming the fact that we are all different and that we all come from different backgrounds, this course actually encompasses many profiles of people and it is intended for anyone seeking self-improvement and personal development. No course is perfect, and there will always be “downsides” to every product that you purchase. On the question: Is this the best self-improvement program out there the answer is, NO, it isn’t. But on the question: Should this program be included on your shelf with all the other personal development and self-improvement arsenal? The answer is a resounding absolute YES! On the question whether I have achieved any significant results as the direct outcome of listening and following this course, my answer would be NO. Not because the methods don’t work or because the course is bad, but because I already had achieved lots of success in all of those areas prior to even purchasing the product. My purpose of getting Mind Secrets Exposed was to even further broaden my knowledge and understanding upon this matter, and I can honestly say that lots of the information taught in the course is actually something I practice on a daily basis. I also created some new habits that prior to that I hadn’t developed. For example I really took gratitude more seriously in my life. I also learned to use vivid visualizations when my subconscious is most receptive for suggestions (at the lowest possible level – close to Alpha State which happens somewhere between sleep and the point when consciousness shuts down). In total, I am satisfied with the value I got out from it. For you it might be different, depending on your current desires and needs in your life. If you’re hesitating whether you should purchase this course or not, then please read the last section which will help you to make a decision! First of all – it is important how much money you have to currently invest in yourself. If you are really on a tight budget, then please, don’t invest in the program right now! Why? Because you can better purchase several books which will be much cheaper and you are still going to learn a ton of great techniques. However, they should be the basis of your personal development arsenal and you should always strive to gain new knowledge which might help you tremendously in your growth in life. So if you fall into this category, remember this program and come back later when you feel comfortable investing the money and also don’t forget, you always have the 60 day money-back guarantee! If on the other hand, you DO have $67 to invest in yourself and are looking for some great resources to further develop and grow in life – then by all means, GET THIS PROGRAM! Like every other self-help course – it will help you in restructuring your life. If you truly desire to change, then you must take a look at Mind Secrets Exposed. MSE will provide you with the necessary tools, tips and advice for you to take a quantum leap in the results you get in your life.